Malvern Pizza Restaurant uses their own specialised couriers to deliver their food. Garlic and tomato sauce base, cheese, parmesan cheese and parsley. Pizza napoli, cheese, olives, anchovies. Pizza napoli, cheese, onion, tuna, parsley. Pizza napoli, garlic & herb base, fresh diced tomato and onion. Pizza napoli, cheese, ham, bacon, egg and herbs. Pizza napoli, cheese, ham and pineapple. Pizza napoli, cheese, mushrooms, onions, capsicum, olives and herbs. Pizza napoli, cheese and lots of pepperoni. Pizza napoli, cheese, ham and salami. Pizza napoli, cheese, salami, mushrooms, green peppers, onions and anchovies. Pizza napoli, cheese, ham, mushrooms and olives. Pizza napoli, cheese, seafood mix, anchovies and garlic. Pizza napoli, cheese, chicken, and pineapple. Pizza napoli, cheese, chicken and bacon. Pizza napoli, cheese, chicken and avocado. Pizza napoli, cheese, chicken and peri peri sauce. Pizza napoli, cheese, salami, ham, bacon and barbecue sauce. Pizza napoli, cheese, onions, olive, chili and beef. Pizza napoli, cheese, salami, mushrooms, green peppers and chili. Pizza napoli, cheese, ham, salami, mushrooms, green peppers, onions, olives, pineapple, seafood mix and bacon. Pizza napoli, cheese, ham, mushrooms, pepperoni , prawns, onions and oregano. Pizza napoli, cheese, mushroom, pepperoni, baked potato and oregano. Pizza napoli, cheese, ham, mushroom, prawns, garlic and oregano. Pizza napoli, cheese, potato, onion, tomato, garlic and oregano. Pizza napoli, cheese, salami, olives, capsicum and jalapenos. 5 meat lover + chicken & Virginia ham. Tomato, mozzarella, sausage, olive, jalapeno, sun dried tomato, feta, finished with fresh basil and chipotle sauce. 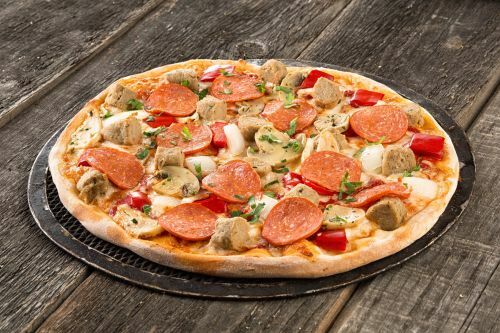 Tomato, mozzarella, sausage, olive, jalapeno, sundried tomato, feta, finished with fresh basil and chipotle sauce. Tomato base, mozzarella, house roasted marinated lamb, onion, finished with fresh parsley, with garlic aioli and a lemon wedge. Bolognaise sauce base, mozzarella, spinach, baby meatballs, bocconcini, finished with fresh basil. Tomato base, mozarella, Portuguese spiced chicken, capsicum, onion, finished with our Peri-Peri sauce. Tomato base, mozzarella, spinach, roasted pumpkin, feta, onion, pine nuts finished with mint yoghurt. Tomato base, mozzarella, house roasted spiced lamb, roast pumpkin, cream feta topped with fresh baby spinach toasted pine nuts and minted yoghurt. Tomato base, mozzarella, marinated chicken, chorizo, onion, finished with a homemade chipotle sauce. Tomato base, mozzarella, spinach, potato, halloumi cheese, olives, finished with lemon wedges. Tomato base, mozzarella, prawns, chorizo, paprika, finished with spring onion and a homemade chipotle sauce. Onion, bacon, olives in a napoli sauce . Chicken breast, bacon, egg, spinach & parmesan cheese. Bocconcini, mozzarella & shaved Parmesan cheese, oven roasted chicken, crispy bacon with creamy white wine sauce. Italian sausage, sundried tomato, jalapeno, mozzarella cheese with meat sauce. Double beef patty, double bacon, double American cheese, tomato sauce, aioli, toasted Turkish bun serve with chips. Crumbed chicken breast, grilled bacon, onion, American cheese, gourmet tomato, salad mix, pickles, aioli, tomato relish, Toasted Turkish bun serve with chips. Beef patty, salad mix, gourmet tomato, caramelized onion, American cheese, pickles, aioli, tomato relish, Toasted Turkish bun serve with chips. Beef patty, salad mix, gourmet tomato, caramelized onion, American cheese, grilled egg, grilled bacon, pickles, aioli, tomato relish, Toasted Turkish bun serve with chips. Double 'N Cheese Steak Burger. Grilled Stake fillet, grilled egg, grilled bacon, salad mix, gourmet tomato, American cheese, BBQ sauce, Toasted Turkish bun serve with chips. Double Grilled bacon, salad mix, tomato, jalapenos, pickles , peri peri sauce, Toasted Turkish bun serve with chips. Veggie patty, Salad mix, caramelized onion, American cheese, pineapple, tomato relish, aioli, Toasted Turkish bun serve with chips. Grilled Chicken tenderloins, smoked Virginian ham, halloumi cheese, salad mix, gourmet tomato, onion, tomato relish, BBQ sauce, Toasted Turkish bun serve with chips. Grilled chicken breast, grilled chorizo, American cheese, salad mix, gourmet tomato, onion, avocado, homemade peri peri sauce, Toasted Turkish bun serve with chips. Beef patty, grilled mushroom, caramelized onion, gourmet tomato, salad mix, tomato relish, BBQ sauce, Toasted Turkish bun serve with chips. Crumbed veal, grilled bacon, onion, American cheese, gourmet tomato, salad mix, pickles, aioli, tomato relish, Toasted Turkish bun serve with chips.